Duration: 5 minutes 14 seconds. On May 30, 2018, the Presidential Library hosted a round table where cultural and educational projects on the history of Russian sports and national football were presented. In the mode of the space bridge, the event was joined by the participating cities of the World Cup, including Moscow, Volgograd, Saransk, Sochi, Samara, Ekaterinburg, Kaliningrad. 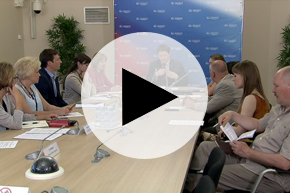 Also in the round table took part: Vladimir, Grozny, Tyumen, Moscow region, Penza, Rostov-on-Don. On the eve of the World Football Championship, the Presidential Library prepared an electronic collection dedicated to sports in Russia, an exhibition "More than a Game", multimedia exhibitions . I. Sennikova, Yaroslav Valeryevna. II. Stanyakin, Anatoly Petrovich. III. Kondrashov, Kirill Alexandrovich. IV. Yarosh, Vladimir Mikhailovich. V. Presidential Library (St. Petersburg) .1. Presidential Library (St. Petersburg, city) - Activities - 2018 - Multimedia publications. 2. FIFA World Cup (21; 2018) - Multimedia editions. 3. The people (the collection). 4. Sport in Russia (collection). 5. Football - History - Russia - Multimedia publications.